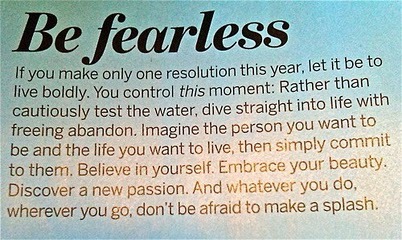 January | 2012 | What about this? Wanting to make a light pasta dish to accompany some freshly grilled fish, I prepared a simple noodle salad with subtle Asian undertones. Unlike the Shrimp and Bean-Thread Salad I posted about a while back, this noodle salad is simpler to make, because it has fewer ingredients. Although, it lacks the complexity of flavors that the Bean-Thread Salad has, it makes up for it with its clean fresh flavors and its ease of preparation. It’s a delicious side dish for grilled seafood or grilled chicken and this recipe makes enough to feed a small crowd. 1. Combine salad dressing ingredients in a bowl and set aside. 2. Fill a kettle full of water and bring it to a boil. If you don’t have a kettle use a large pot to boil water. 3. Open up the package of noodles and place the noodles in a large mixing bowl. 4. Carefully pour the hot water over the noodles until they are completely submerged. After two minutes, very carefully stir the noodles to loosen up the noodle bundle. Stir periodically and make sure all noodles remain submerged. 5. When noodles are limp, taste a few to make sure they are cooked (or softened) enough. The noodles should be firm, but not hard and chewy or soft and mushy. Let soak a few minutes longer if they are not yet ready, checking them every couple of minutes. 6. When the noodles are tender, drain them in a colander and let cold water run over them. 7. After they are well-drained, pour the noodles into a bowl and immediately pour the salad dressing over them. Toss gently with your hands. 8. Add the grated carrots, chopped cilantro and chopped peanuts. Toss gently and serve. 1. This salad tastes best when eaten fresh. 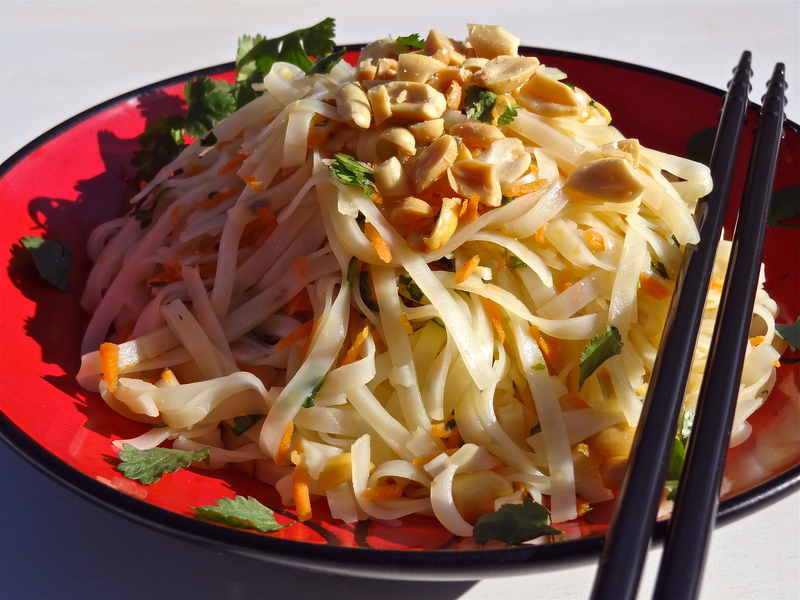 Rice noodles tend to absorb any liquid available and then dry out. Store in a tightly sealed container in the refrigerator. 2. In lieu of steps 2 through 4, you can bring a large pot of salted water to a boil, add the noodles and cook for about 2 minutes, stirring and checking them for the right degree of tenderness. 3. My family likes spicy food, so I either add a bit more chili sauce to the dressing mixture or I sprinkle in some red pepper flakes. 4. To make this a main dish, cooked prawns, grilled salmon, or grilled chicken breast strips can be easily tossed in during the last step. 5. Buy Asian chili paste that has chili flakes floating in it. 6. This recipe makes enough to fill a large mixing bowl. 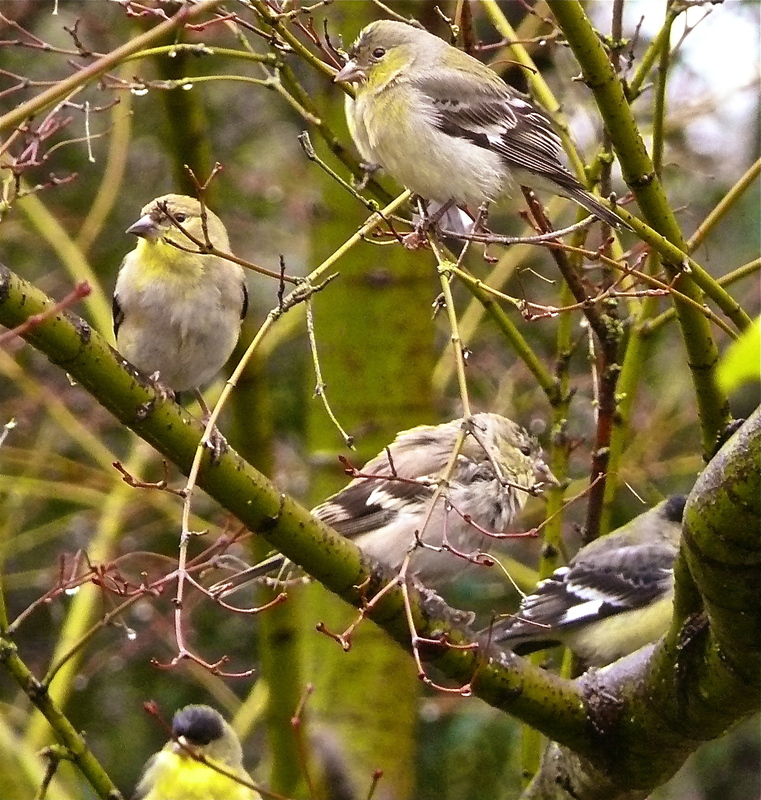 It was so cold outside that the birds looked all puffed up in their little down jackets. For me, dressing up like Nanook of the North and going out in the freezing cold at midnight is not something I like to do, but the weather forecaster on T.V. said, “There’s going to be a hard freeze tonight.” Difficult as it was to leave the warmth of our home, my hubby and I got out our bin of burlap pieces and clothes pins and went outside to cover our frost-tender plants. While I was outside draping and pinning, I thought about all the homeless people trying to stay warm on that cold, cold night. Shame, guilt, and sadness struck me. Here I was protecting plants when people – men, women, and children – were freezing in the night. 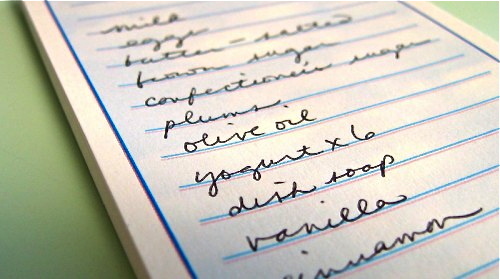 Chef Alex Guarnaschelli offers six tips on how to reduce food waste. And remember that some of the food you waste also can go into compost piles. Want to start a compost pile, but don’t know how? Read Earth Easy’s article on composting. In the essay below, Rosemarie Urquico espouses the many reasons for dating a girl who reads. I loved it when I first read it – how could I not, since it’s all about reading and writing! Supposedly, it was written in response to Charles Warnke’s You Should Date an Illiterate Girl. Make sure you read both pages of Mr. Warnke’s piece. A while back, I wrote about Pinterest, the online pinboard. Many, many great ideas on numerous subjects can be found on Pinterest boards, but I especially like the ones that display truly creative ways to reuse things. 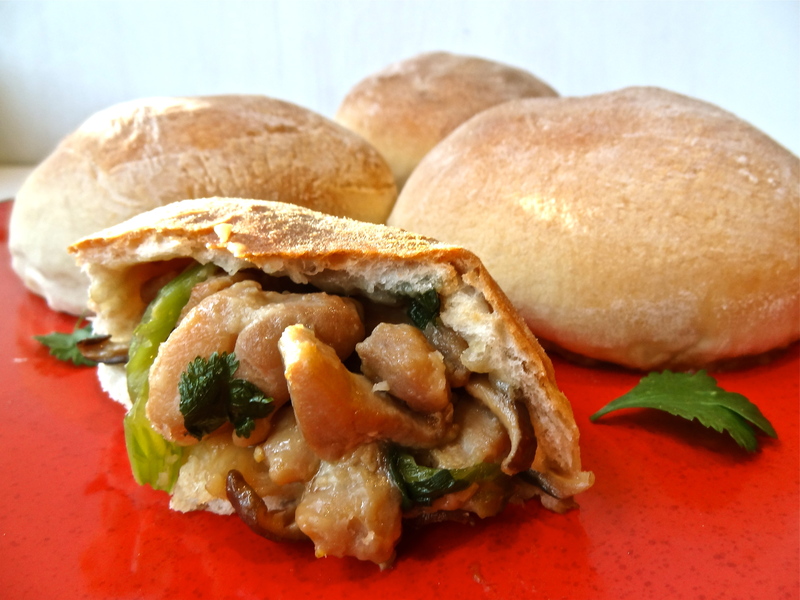 A soft, yet crusty, bread surrounds succulent pieces of chicken and savory bits of celery, mushrooms, green onions, and bamboo shoots in these big and hearty Chinese Chicken Buns. Soon after you bite into a freshly baked one and let the flavors flood into your mouth, you’ll pat yourself on the back and say, “Damn, I’m a good cook!” It had been years since I last made these buns, but while deciding what to make for a Chinese New Year’s post, I remembered these delicious buns and it occurred to me that they would make fabulous Super Bowl fare, too! They can be made ahead and frozen for future use. But seriously, after you’ve taken your first bite of one, you’ll want to live in the present and not the future! 1. Remove frozen bread dough from the package and thaw as package directs, rubbing surface with a little bit of oil and covering with plastic film. Thaw just until pliable, about 1-2 hours at room temperature. 2. Hard boil the eggs and let cool. 3. Rinse and soak dried Asian mushrooms in enough hot water to cover them until soft and pliable, about 20 minutes. Cut off and discard tough stems; cut remaining mushrooms into thin strips. 4. 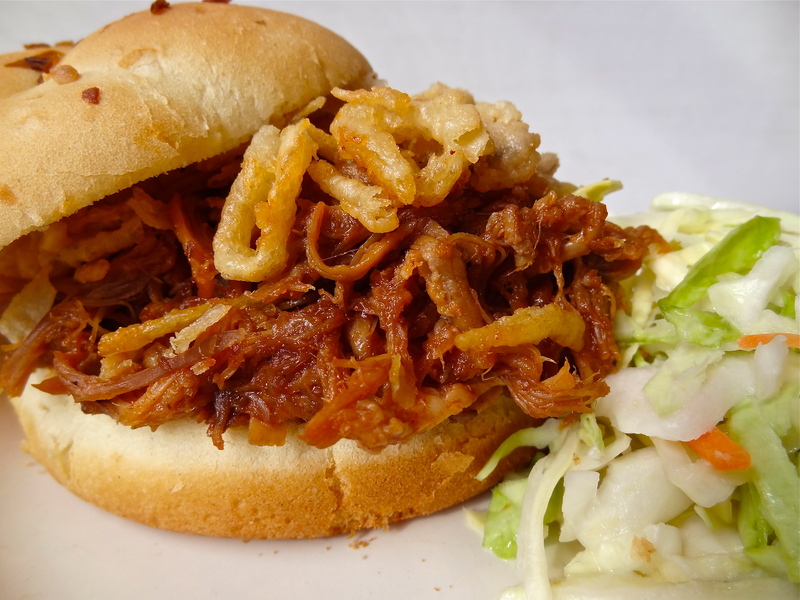 Cut chicken meat into 1/2-inch-thick strips, each about 2-inches long. 5. Combine chicken with 2 tablespoons soy sauce, 2 cloves of garlic, minced, and 2 teaspoons minced fresh ginger. 6. Thinly slice celery stalks on the diagonal. 7. Wash green onions. Cut into 2-inch lengths (including tops). 8. Drain can of bamboo shoots. 9. 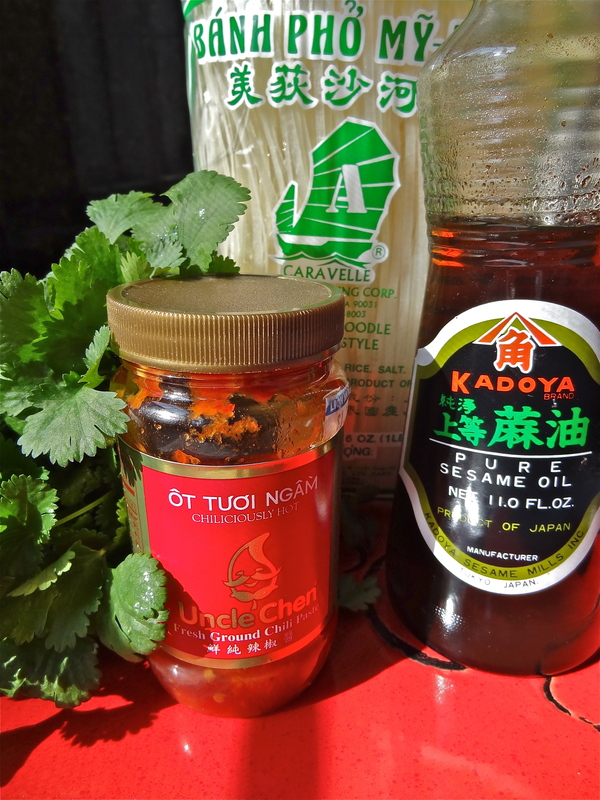 Stir together sauce ingredients (listed above). 10. Pour 2 tablespoons oil in a 12-inch frying pan and place over high heat. When the oil is hot, add the marinated chicken; cook, stirring constantly, for 3 minutes. 11. Add celery; cook, stirring for 1 minute. 12. 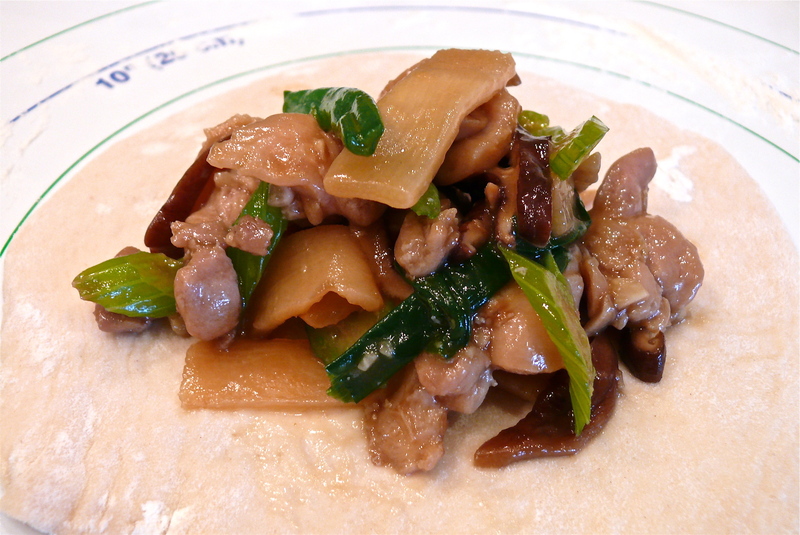 Stir in sliced mushrooms, sliced green onions, bamboo shoots, and sauce mixture. Cook, stirring until sauce thickens. Let cool. 13. Peel the eggs and cut in quarters, lengthwise. 14. With a lightly-floured knife, cut each thawed loaf into 4 equal pieces. Roll each piece into a ball. On a lightly floured surface, roll each ball into a round about 7-inches in diameter. 15. 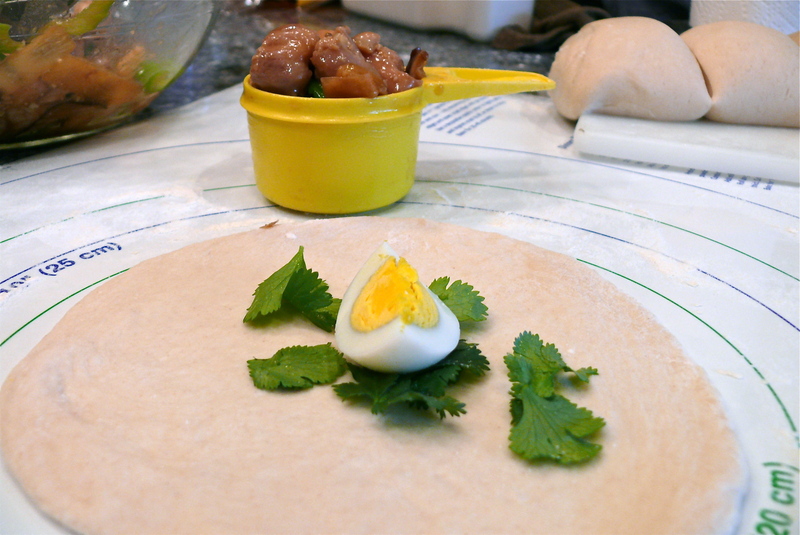 Place 1-2 sections of hard boiled eggs in the center of the dough. Top with 1/2 cup of the cooked chicken filling. 16. Gather edges of dough up around filling, being careful not to stretch the dough. Pleat in the edges and tightly pinch together to seal. 17. Turn on oven to 350 degrees F.
18. 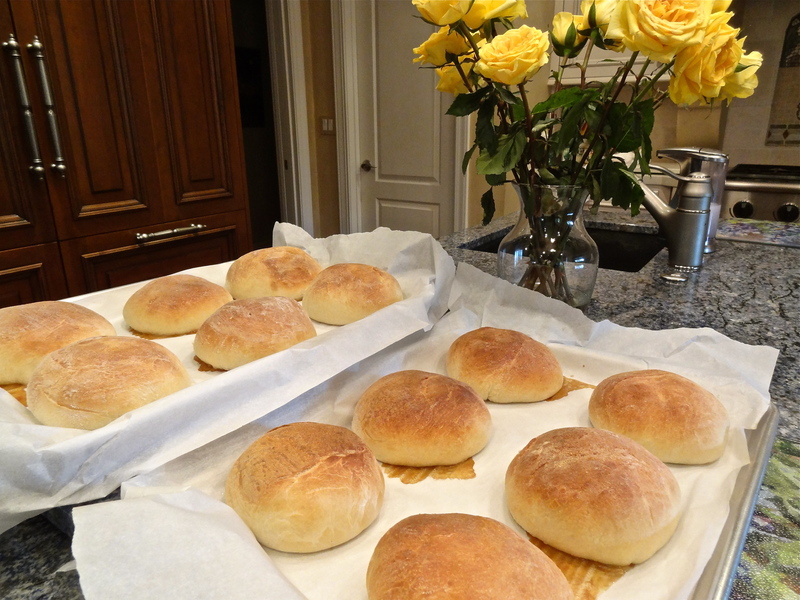 Place, buns, pinched side down about 2 inches apart on a lightly greased or parchment paper-covered baking sheet. 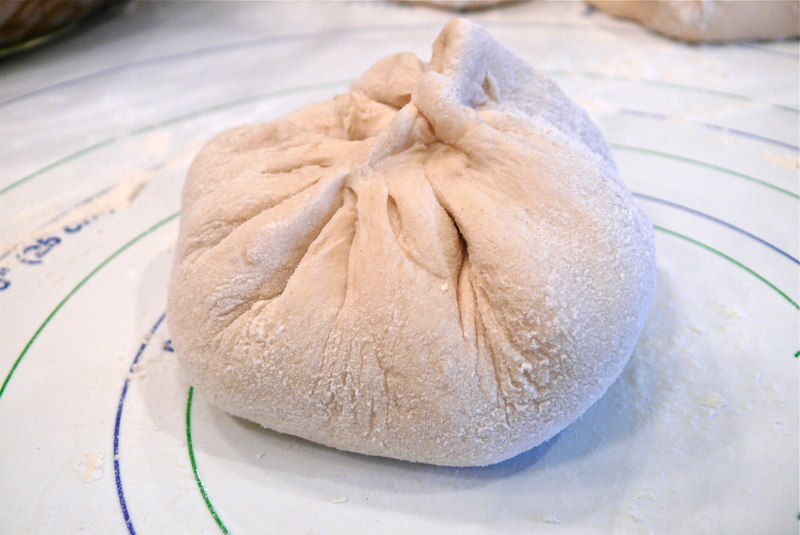 Lightly cover and let rise in a warm place until puffy, about 30-45 minutes. 19. Brush with melted butter and bake for 30-35 minutes or until browned. Serve warm. 20. If made ahead, cool thoroughly on racks, then cover and refrigerate or freeze. To reheat, bake uncovered, in a 350 degree oven until hot, about 20 minutes if chilled. If frozen, bake for 35 minutes. 1. Dried Asian mushrooms can be found in most grocery stores and in Asian markets. The most common ones are the dried Shitake mushrooms. To soak dried mushrooms, place them in a bowl and cover them with hot water. Place a smaller bowl or plate on top of them to keep them submerged in the water. 2. I always double the recipe! Eight is never enough! 3. 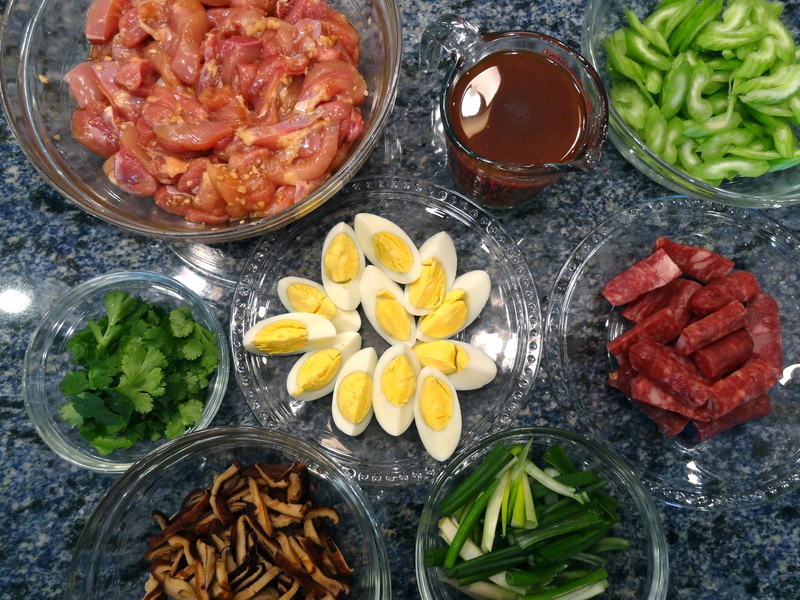 I tend to always add a little more of everything – more mushrooms, more celery, more green onions, more meat . . . and I usually double the amount of sauce. 4. I cut the 2-inch top segments (white part) of the green onions in half lengthwise, so that there are no thick pieces of onion to bite into. 5. Although the inclusion of slices of hard boiled egg is typical in a Chinese Chicken Bun, you can always choose not to include them if they are not to your liking. 6. 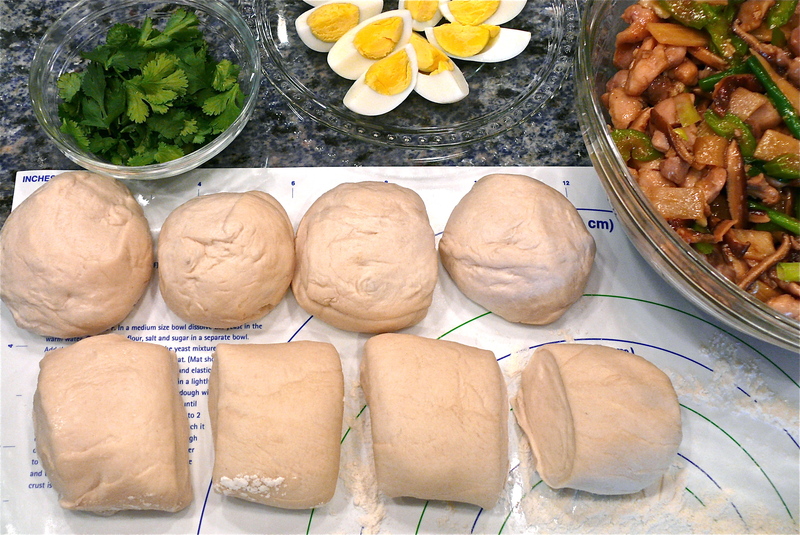 I like the taste of cilantro in these buns, so I sprinkle a few cilantro leaves on top of the dough before adding the meat mixture. 7. Sometimes for an added rich and exotic flavor, I add pieces of Chinese Sausage into the chicken mixture. New Year resolutions speak of hopes, dreams, and new starts, but shouldn’t every morning bring with it the same potential? Why wait a day, a month, or 12 months to start something new or to create the life you want? There will never be a better time than now to eat better, to sharpen your mind, to make a difference, or to see the world with all of its colors! Danish-Icelandic artist Olafur Eliasson designed an enclosed circular rainbow walkway above a building in Denmark. I wonder, along with another commenter, if your mood changes as you walk through the colors? Is the food shown in ads the same as what’s served? Here’s an interesting side-by-side photo comparison. On the left are ad photos and on the right are photos of food actually served. Why do we eat fast food when it’s not so great to begin with and is even less appealing than promised? When I was a child, my mom and I would sit for hours working on jigsaw puzzles. Jigsaw puzzles are addicting because you can’t stop searching for that one particular piece you need. When I found out that National Geographic’s website had a jigsaw puzzle generator, I immediately bookmarked it on my computer and sent the link to my mom. Although they do not contain very many pieces, these puzzles, made from National Geographic photographs, are difficult because the image disappears once you start working on the puzzle and you must reconstruct it from memory (unless you cheat by using the preview function). On top of that, your effort is being timed! #4 – In the Beginning . . .
Watch this charming 4 minute story about global warming with its amazing painting by Alice Ninni and soothing background music by Matteo Negrin. Have an enjoyable, but safe holiday weekend! I never knew what the big deal was about butternut squash soup until I tasted some at a Zagat-rated restaurant. 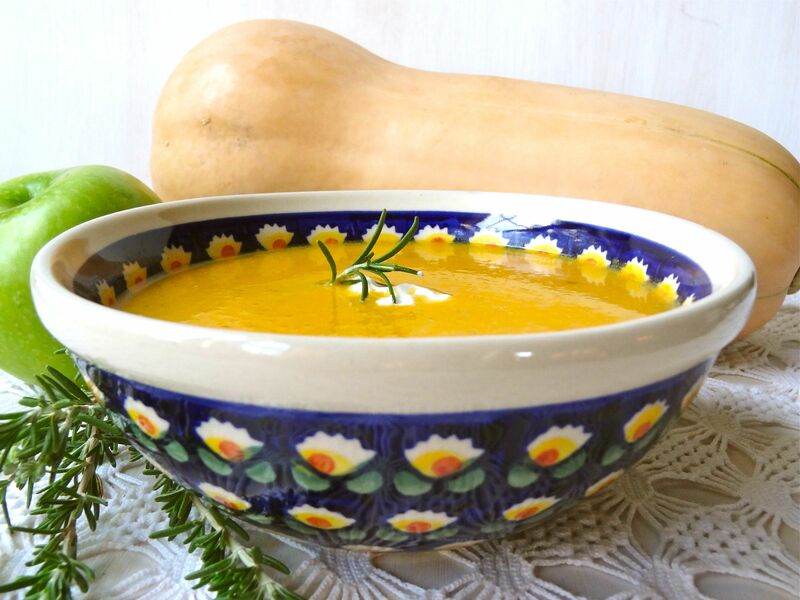 It was thick and creamy like most squash soups are, but what made this one stand out was the surprising taste of apple in it. As soon as I got home from dinner that night, I searched the Internet for a similar soup recipe. None of the recipes I found was exactly what I was looking for and I was disappointed. Then at the end of a long day of Christmas shopping, I came across a cookbook for soups and stews that contained a recipe for a butternut and apple soup. Although, I was supposed to be buying gifts for others, I quickly snatched up the cookbook and bought a gift for myself! 1. In a soup pot over medium-high heat, melt the butter. Sauté the onion and shallots until softened, about five minutes. 2. Add the apples and squash and cook until nicely coated, about 3 minutes longer. 3. Add the stock and rosemary and bring to a simmer. Add the thyme. 4. Reduce the heat to medium and simmer, covered, until the vegetables are very tender, about 25 minutes. 5. Remove from the heat. Using a handheld or standing blender, purée the soup until smooth. 6. Stir in the half-and-half and season with salt and pepper. 7. Reheat gently over medium-low heat. 8. Ladle the soup into warmed bowls and garnish with the sour cream and rosemary and thyme leaves. 1. Just a reminder, butternut squash are easier to peel if you microwave them on high for two minutes first. 2. I would have liked this soup even more if it had a more pronounced apple flavor. The next time I make this soup, I will add one more apple. Also, I think I will experiment with different varieties of apples to see which one gives the soup the best flavor. 3. Other dense, orange-fleshed winter squash could be substituted for the butternut squash.